Talk UX is an annual design and technology conference hosted by Ladies that UX Boston (LTUX). LTUX is a global organization that has created an international community of supportive and inspiring women in design and technology. This year’s conference was held at the beautiful Joseph B. Martin Conference Center at Harvard Medical School. There were roughly 500 people following a single stream of presentations and discussion panels by women in leadership. UX leaders, designers and researchers as well as professionals not actively working in UX attended this event. Laura described some methods that Google uses to stay true to their user-centered strategy. One method she talked about was Google’s immersion studies, in which product teams go to the users. Per Laura’s suggestion, Google fashioned a 15 passenger van into a usability lab to test their users in their contexts across the country. In another immersion study, the Maps team went to India. During their time there, they noticed that people were using their mobile phones with both hands while sitting as a passenger on a motorcycle driving down a highway – not exactly an environment the Maps team anticipated for potential users. Laura also employs user research frameworks to help her team design for a measurable, macro-level impact and to stay focused on their user-centered strategy. Frameworks like Google’s Happiness, Engagement, Adoption, Retention and Task Success (HEART) Framework helps measure the quality of user experience. 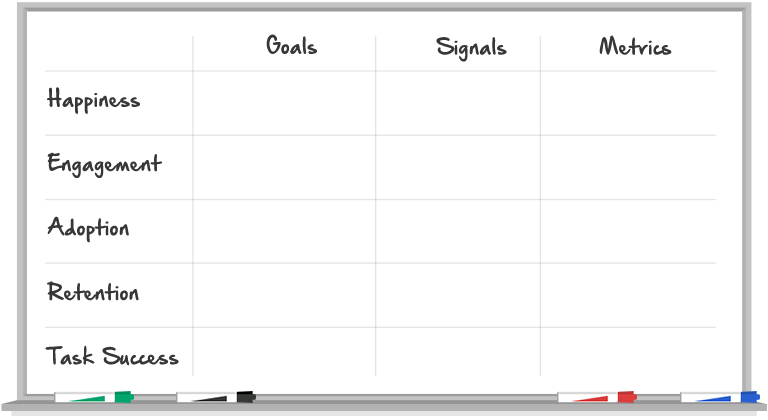 Using the Goals Signals Metrics process with the HEART Framework, you can reverse engineer your goals and signals to identify meaningful metrics. HEART Framework by Kerry Rodden. Image by Digital Telepathy. PluralSight is a technology education platform that uses data to guide their users to the best fitting content. Jess and Kira outlined a UX discovery framework used at PluralSight and how they leverage data to enhance the user experience. In building personas, they include the analytics of behaviors. When identifying the voice of the customer, they identify pain points and map them to analytics and behaviors of the users. In customer preference tests, they run A/B tests and use real content to gather realistic data. This panel of high achieving women in leadership was nothing short of inspiring. The first discussion topic was focused on how each leader advocates for UX in organizations where it’s not yet a focus. The common theme in their answers was that they have to speak in the language of business executives and prove the worth that UX can bring to the business. The panelists also discussed how they go about structuring the team for growth. The leader from Hubspot talked about it took her almost a year to create a future proof organizational structure that will meet the business needs, team needs, as well as customer needs. Being in a relatively new field, these leaders get little to no direction from their bosses. The panelists all agreed that it takes a significant amount of forward-looking exploring and many trials and errors to grow their UX practices in the right way. The second panel of the day included the LTUX founder, Lizzie, and two LTUX directors. Lizzie stated that she and her founding partner never imagined that Ladies that UX would become an international organization. Little did they know, thousands of female UXers around the world were seeking exactly the type of community that they began. The panelists discussed how they provide leadership, networking and presentation opportunities at various events in order to help build up the members of LTUX. “Wicked problems” is a phrase originally coined by Horst Ritter and Melvin Webber in 1973 in their research of issues around policy and urban spaces. In its original use, wicked problems described types of problems that plagued humanity, such as poverty and crime; problems for which solutions often come with inadvertent consequences. Lola adapted the phrase “wicked problems” to apply it to the digital space as technology companies often face problems that plague the whole team, such as legacy technology and technical literacy. The nature of wicked problems is that they are continuously evolving and resisting complete resolution. Lola identifies four general tips that can guide teams to creating fixes for wicked problems. Understand the contextual constraints – While it’s admirable to idealize for the end user, it’s not valuable unless you can understand the contextual constraints that you’re designing within. Leverage tools like System Journey Maps to help get everyone on the same page. Start speaking dev – UX professionals should think pragmatically and learn about the technical considerations that the developers on their team are up against. Co-location and developer + designer workshops are methods that can help build empathy and align perspectives. No blame game – There is no “They”, it’s all “We”. Adopt the idea that you’re in it together and accept that constraints evolve; this may cause development to sometimes stray from the designs specifications. To help align the team, jointly track and prioritize failure points. Take action where it’s needed – When unexpected issues arise, don’t sweep them under the rug. Collaborate by listening to your stakeholders, colleagues, team, as well as customers where necessary. The next session was focused on the importance of Web Content Accessibility Guidelines (WCAG) and how to test for it. Amy first explained that organizations might be motivated to build websites that are accessible in order to 1) make their users’ lives easier 2) reach a wider audience, and 3) avoid lawsuits. Various departments at Harvard University look to Amy to help make sure their websites meet the WCAG standards. Amy and her team at the Harvard Library use accessibility tools as a starting point to identify necessary fixes for the website. They leverage tools like WAVE, JAWS, NVA, VoiceOver, Chrome Vox, and ZoomText but Amy stresses that while useful, accessibility tools won’t give you a complete picture of the accessibility of the website. In order to get a holistic view of a website’s accessibility, they look to their accessibility testing participant pool to bring in actual assistive technology users who can help identify accessibility issues that the testing tools missed. Lara laid out Hubspot’s process to create, roll out and maintain an evergreen design system. The design system that Lara and her team created is called Canvas. The Canvas team first completed a component audit to identify necessary elements and redundant ones. During this process, they found that several button styles in use across the organization were identified as “primary.” The decision to reduce the number of primary buttons to one was unanimous. The next step in the process was to align the team members on the names of UI elements. They played a game called “What would you call this?” and ran a card sorting exercise to categorize and name the components. Through these activities, they were able to find and use a common language. When it comes to building a successful design system, Lara’s mantra was to “Make it easy to do the right thing.” In order to encourage designers, developers and content creators across the organization to use the design system properly, Lara knew that the Canvas team would have to make something that is really easy to use. They accounted for common groupings of elements and they designed a system that allows for a growing feature set and feature requests. Lara stresses that the biggest takeaway from this experience is that you should define a process and not a project. Rolling out the new design system to every corner of Hubspot would take an immense amount of time. But defining a process in which the design system should be maintained and rolled out over time ensures that the new design system will be implemented consistently across product teams. In the last session of the day, Elena walked us through a number of tips for the content strategy of chatbots. The primary takeaway is that you should set expectations. When a user begins an interaction with a chatbot, the system should help the user set goals for the interaction, identify the features of the chatbot, and explicitly lay out the user’s tasks. There should be healthy boundaries – the users should know what can and can’t be done during this chatbot interaction. In the case where a user’s inquiry cannot be answered programmatically, consider using a hybrid approach where predefined responses are used in most scenarios and complicated inquiries can be elevated to a customer service representative.